Last Sunday, I read an interesting article in a print magazine. It’s a rare occasion nowadays so I turned back to the story’s first page to find out the writer’s name. Then I opened the Twitter application on my smartphone. 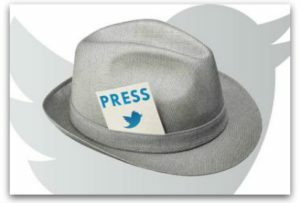 I’ve learned that Twitter is the best way to follow interesting writers, journalists and essayists. You’ll type in the writer’s name, find her Twitter account and click follow. Many writers don’t tweet often, which I think is a blessing. 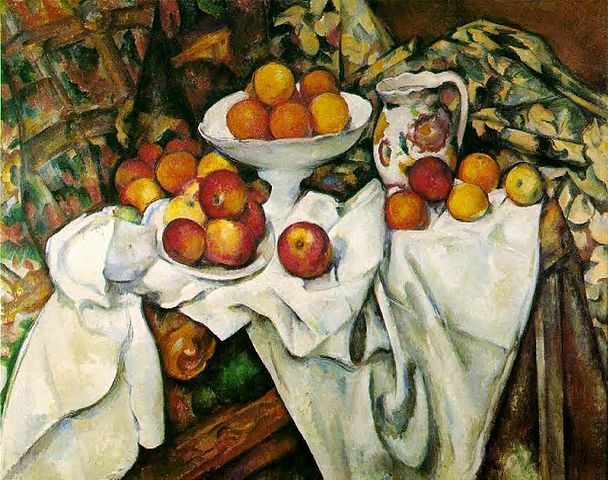 Instead of daily pseudo-clever notions about everyday life, I’d rather see an occasional well-thought tweet with a link to read more about an interesting topic. I don’t want to follow magazines or publications tweeting about their most popular stories in a clickbait style. I’d rather pick myself the few interesting writers to follow, and get updated on their latest stories. This especially applies to freelancers who write for multiple publications at an irregular interval. See, there’s at least one interesting use case for the 140 character tweets! Back to last Sunday. To my astonishment and disappointment this guy didn’t have a Twitter account. What’s going on, Hannu Pesonen? It looks like Mr Pesonen has both the experience and expertise to cover Africa and Middle East in an interesting manner. I’m sure I wouldn’t be the only one interested in finding out more about these topics. We want to know when a new article or book is out there. I don’t know about this particular case but, in general, a freelance writer would benefit from being active in social media. Having an established follower base helps to convince the potential publishers. The CEO of a public company tweeted today about an interview. In the interview, the president of Nasdaq Helsinki sets up a portable studio and dicusses with Marimekko’s CEO Mika Ihamuotila about issues that are interesting to shareholders and traders. Great stuff! Finally a business that makes real, original content to engage its customers. This is not just a consultant repeating fancy ideas about inbound marketing, death of cold calls, content strategy, and social selling. This is not just a poor community manager tasked with fabricating stories, sans facts and figures. This is not just a campaign with polished edges, made by your shiniest and most innovative digital agency. This is the real thing. The president of a stock exchange himself grabs a camera and goes to interview the head honcho of a publicly traded firm. The interviewer of that stature is bound to have access to interesting people. And respectively, the interviewee calls the bets in their company. Sounds like an excellent foundation to build on. As neither the interviewer or interviewee is a media professional, the result is a bit rough. Furthermore, neither is talking their first language, which takes away from conversation flow. But that’s not the point! The point is the fabled, hard-to-reach authenticity that differentiates this piece of content from what most companies are producing. I’d say this the kind of content businesses should create. You know, if you’re not putting out stories, you basically don’t exist. Alas, reality is not quite so good. The video is almost two year old and looks like it’s the only episode of Lauri’s Portable Talkshow. Why so? Probably because it takes significant time to produce such content. It’s easier just to do what everyone else is doing, i.e. create a separate “social media team” and invest in Facebook ads so that you can focus on real work. Zenefits is a company in trouble. They missed revenue projections, face regulatory charges, and their founder/CEO was forced to resign. How to pick up from here? The new CEO, David Sacks sent an email to all employees. The email was said to be “brilliant”. Let’s see what’s in it. Parker has resigned because of his mistakes. We will work on governance and compliance to fix the problems. I’ll appoint Josh Stein as our Chief Compliance Officer. Our company culture is outdated, here are our new values: 1. integrity, 2. customer success, 3. job satisfaction. As a CEO I will first focus on culture and values. Then we’ll sharpen our strategic focus. We’ll focus on small business market because it’s huge, underserved market with product-market fit for us. Purpose of Zenefits is to make it easier to hire, onboard and manage employees of small businesses. That’s a good structure. Lay down the facts, explain how the problems will be solved, give a vision of the future. However, the email is loooong. It takes 1000+ words to tell the above information, which is less than 100 words. What else is in the email? By now all of you have heard the news that Parker has resigned as CEO. I know that this will come as a shock. Parker was not only the founder of this company but also its driving force until this day. I know it will take time for people to absorb and process this news, and it will raise many questions about the company. I believe that Zenefits has a great future ahead, but only if we do the right things. We sell insurance in a highly regulated industry. In order to do that, we must be properly licensed. For us, compliance is like oxygen. Without it, we die. The fact is that many of our internal processes, controls, and actions around compliance have been inadequate, and some decisions have just been plain wrong. As a result, Parker has resigned. In order for us to move forward as a company, we cannot seek to hide or downplay the problem. We must admit it and remediate it as soon as possible. In December, we hired a Big Four auditing firm to conduct an independent third-party review of our licensing procedures that we will turn over to regulators as soon as possible. I will expand that effort into a top-to-bottom review to ensure appropriate and best-in-class corporate governance, compliance and accountability. I am also appointing Josh Stein as our Chief Compliance Officer. I know that he will bring the same rigor to this job as his did in his previous experience as a federal prosecutor. Josh is already in communication with regulators to advise and update them of our compliance issues. These steps are a start to fixing the problem, but they are not enough. We must admit that the problem goes much deeper than just process. Our culture and tone have been inappropriate for a highly regulated company. Zenefits’ company values were forged at a time when the emphasis was on discovering a new market, and the company did that brilliantly. Now we have moved into a new phase of delivering at scale and needing to win the trust of customers, regulators, and other stakeholders. As an entrepreneur myself, I know that Zenefits can never lose its innovativeness and willingness to experiment. But at the same time, I believe a new set of values are necessary to take us to the next level. Effective immediately, this company’s values are: #1 Operate with integrity. #2 Put the customer first. #3 Make this a great place to work for employees. In order to be a great company, integrity must be at the core of what we do. We must have integrity in our business practices, compliance obligations and internal processes. We must have integrity in our product. We must have integrity in our data and infrastructure. And we must have integrity in the way we treat each other. We must also put customer success at the heart of what we do. Everything we do should further the goal of earning and extending our customers’ trust. We want customers for life, and if we can’t reasonably expect to make a customer successful, we shouldn’t sign them in the first place. Finally, we must make this a great place to work for employees, because we’re all in this together, and if we’re not enjoying ourselves, what’s the point? This is not to say that there won’t be major challenges and tough days ahead, but that must be balanced with a feeling of fun, fellowship, and esprit-de-corps. I want all of us to feel excited to come into work every day. We all have a role in that, but I’m going to try my best to do my part. I’m making my first actions as CEO about culture and values because I believe these things are fundamental to a company’s success and who we are and want to be. I want to push down decision-making ability into the company. Culture and values enable us to do that by ensuring that everyone is aligned around the right goals. Once we’re aligned as a team around core values, the next thing we’re going to do is sharpen our strategic focus. When you raise $500 million and have a vision as big as Zenefits’, it’s tempting to think you can do everything at once. But no matter your size or resources, companies execute better when they ruthlessly prioritize and sequence their efforts. For us, that means hyper-focusing on the small business market where we have product-market fit. This is a great market for us because (1) it’s huge (with many million small businesses in the US); (2) it’s “greenfield” (meaning that it’s under-served by technology — in fact an Excel spreadsheet is often the main competitor); and (3) the free aspect of our product is extremely compelling. There is one other critical thing that I want to do, and that is make Zenefits a purpose-driven company. I’m glad that Zenefits is one of the fastest-growing business software companies, but that’s not our mission. It alone doesn’t fill my life with any meaning, and I doubt it does yours. However, Zenefits does serve an important purpose in the world, by making the lives of small business owners so much easier. We further the dreams of anyone who wants to start a new company. We help them achieve something larger than themselves, by making it easier to hire, onboard and manage employees. By doing that, Zenefits makes entrepreneurship more accessible to everyone. I believe this is a very powerful and real mission in the world, and personally I’m proud to be part of it. There are very few startups that ever get to this level of scale and importance. This is one of them. This is a founding moment. You are all co-founders in this new path forward. I know how much hard work everyone has put into this company and that we will all come together on this journey. Doc Searls wrote an interesting article regarding Apple’s upcoming content blocking in iOS 9. The main message seems to be that content blocking is good and will make the web better for the people. I admire his ability to take a strong position for content blocking. While I tend to agree that “tracking is spooky” I’m not quite so sure blocking is the right way to go. Don’t develop your website/product unless you can do so as a hobby. That is, sacrifice the user experience? Have access to capital, at least until you have enough paying customers / readers / users. Sacrifice independence? Make ads that don’t get blocked. Sacrifice integrity? It would be technically possible to block only the “tracking” part of ads business. Apple is not doing so presumably because blocking everything forces websites into Apple’s ecosystem as publishers or app developers. Generally, ad targeting is good. The viewer is happy to see a meaningful ad and the advertiser is happy because their ad budget was not wasted. In a perfect world everyone would win. Doc Searls differentiates tracking-based ads and brand advertising. It’s worth noting that also brand advertising can be targeted by choosing the right media: e.g. advertise sports shoes in sports media. Tracking has been a way to “extend” the media so that an advertiser has been able to show sports shoes ads outside sports media by tracking the viewer from the sports context. Maybe this has real privacy implications? A huge part of the web relies on advertising as the primary source of revenue. Ad blocking is an issue to many websites, and the challenge is growing more prominent as we speak. The intrusive ads made the Internet nearly unusable. Adblock is their own damn fault. The heated argumentation reminds me of the mindless anti-vaccine movement. Here’s a piece by Washington Post (n.b. I cleverly replaced vaccines with ads). However, parents who decide not to view ads are not deciding whether to live in a world without ads. Their choice is whether or not to subject themselves to the very slight risk of ads-related side effects or instead to make themselves a rare exception by refusing ads. …Parents who refuse ads are, in a sense, free riders who take advantage of the benefit created by the participation and assumption of ads risk or burden by others while refusing to participate in the program themselves. … they live in a world in which their [web] faces only very slight risk of [becoming payable], due to the decisions of all the other socially responsible website visitors around them who allow ads. If enough people (i.e. almost everyone) follow the public health experts’ advice regarding vaccinations, risks are minimized for all of us. This is herd immunity. If too many people are skipping vaccinations, we are getting more disease outbreaks as a society. 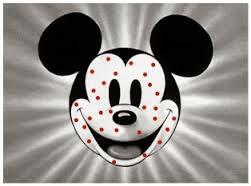 For example: case Measles in Disneyland. Similarly, if many people block ads, the money for operating much of the web must come elsewhere. Considering the scale, this is an interesting issue. 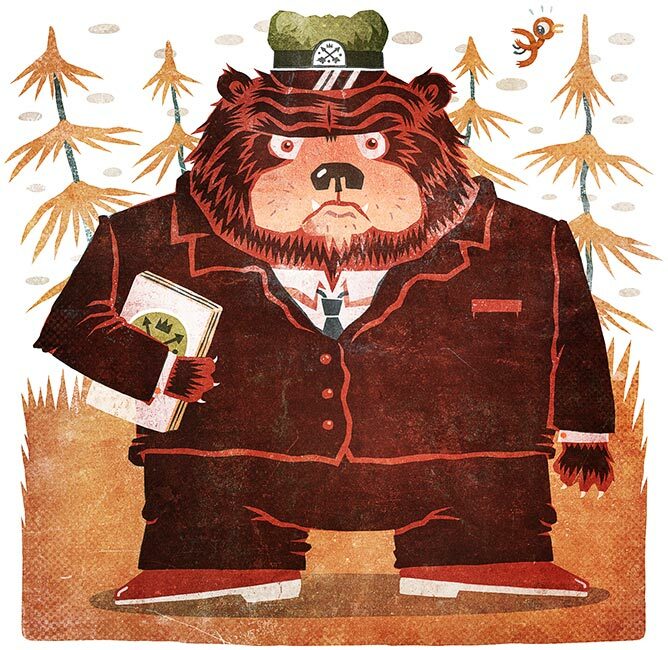 In the current state of the web, ad blocking is definitely free riding – but also a lot more. I hope to find better discussion regarding ad blocking, its consequences – and potential solutions. Can I have both vision and execution, please? People are either 1) vision or 2) execution thinkers. Visionists talk on a high level and focus on values and mission. Executionists think in concrete terms and focus on feasibility and strategy. Visionists and executionists have tough time understanding each other. You see this divide everywhere. Case 1: Political discussion. There was a recent heated discussion in Finland regarding multiculturalism. A member of parliament blurted he wants to fight multiculturalism. The blurt caused a stir. And rightly so as he is known to have connections with neo nazis. In response, many people accused him of racism and raised the theme of dignity and equality. Which, of course, got angry response from yet other people who felt that you can’t say anything about the problems of multiculturalism without being accused of racism. And so on, you know the drill. On one hand we have people talking about respecting and accepting other people. These guys are the visionists. On the other hand we have people talking about preventing etnic riots in suburbs and carving rules for religious signs in schools. These guys are the executionists. The problem is not that they disagree (most of them probably don’t!). The problem is they think in different levels. Case 2: Product strategy. Every entrepreneur is familiar with the mismatch between company vision and product reality. In your team/board there are always both visionists and executionists. There are people who like to brainstorm, throw ideas, think outside the box and dicuss interesting business development opportunities. And there are the people who want to launch the MVP as soon as possible, who are thinking ways to organize the sales team, who want to focus on feasibility of the plans. Don’t forget to bring your popcorns if you put these two in the same room and let the dispute begin. How about Case 3: Raising children? Visionist parent discusses healthy lifestyle, fair-play values and varied physical exercise. Executionist parent knows their child loves basketball, looks for relevant info and goes on choosing between Tue or Thu evening for the childrens’ basketball school for the autumn, provided by the local sports club at the near-by field that has a safe access from the house. Both visionists and executionists are needed. The curious thing is that if you’re good in formulating the questions, you’ll find that both kinds of people agree for the most of the time. In the end it’s only emphasis that differs, not overall values or guidelines. But thinking in different levels is bound to create misunderstanding. Checklist: Should I Stick or Quit? The most valuable resource for an entrepreneur is their time, and if they are wasting it on a quixotic startup, they will never get that time back. 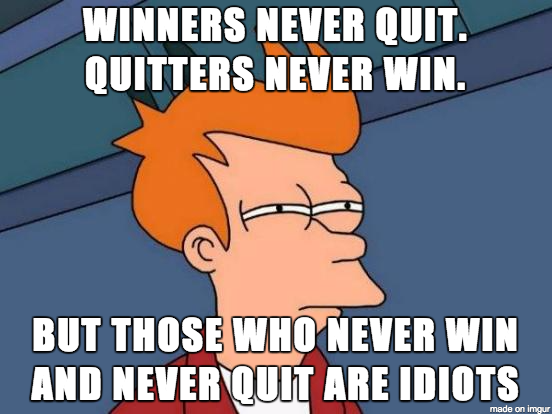 But when you’re winning, when you’re REALLY winning, it feels easy. If it feels hard all the time, then you are probably doing something wrong. And when you’re doing something wrong all the time, then you should probably stop. Is this fun? Hard fun and serious fun are both among the valid types of fun. If I’m accomplishing meaningful things with a good team, it’s fun. Am I learning new stuff? Does this pay for living? Am I able to support my family? Security is not a fashionable startup concept, but I think security has value when you are responsible for other people. Is this helping me to fulfil my dreams? Do I have a chance to become financially independent? Is this the most interesting thing for me to do? If the only chance to do something else, something important is right now, then I’d need to consider the opportunity cost. Answer “YES” to all five, and the decision is easy. Same goes with 5 × “NO”. In between is where it’s difficult. I’ve seen talented people get stuck to a business that pays for a (good) living. If you are really good at what you do, it’s easy to become a well-paid consultant. But is that enough for a life? Should they quit their comfortable, established business and laboriously start something new? Hint: the above checklist helps to find the right answer. I want to learn French language. I thought it would be perfect to attend a course in Brussels, Belgium. Brussels is a French-speaking international city. Lots of active expats move in Brussels every year. The demand for language courses must be huge. However, it’s crazy difficult to study French in Brussels. I’ve heard rumors of people successfully enrolling to a class, but I didn’t succeed. Here’s what I tried, and why I think there is an opportunity for a new player. Find the schools providing French classes. All it takes is some googling, and you’ll quickly have a list of schools. The thing is that none of the existing schrools does very good work on SEO or online ads. Maybe their primary messaging channel is something else than the Internet? This makes it feasible for a newcomer to enter the market. Figure out if a particular course is worth a second look. Does a school target illiterate refugees, exchange students, exapats or someone else? This is difficult, if not impossible to say. Either the schools don’t have a target group or they communicate it badly. The schools spell out requirements, organizations providing their funding, etc. They use terminology that carries no meaning to someone coming outside of Belgium. “A commune? What’s that, I thought I’m living in Brussels.” The lesson: customers should be spared from learning the school’s internal administrative terminology. Figure out if a class is right for me? It is totally amazing but most schools put no effort in describing their product. What does “French as a foreign language, A1” mean? What does A1 stand for? Is that the Je m’appel Jussi. Une, deux, troi -level of conversation? Should I instead take A2 or even A3? It’s like Zappos would sell a pair of shoes without revealing the size. Which exam to take? Are there different exams for total beginners and advanced classes (sometimes: yes). When is the exam? Don’t go at a wrong time or they won’t have the applicable lists – yes, paper lists of students – available. Enroll! Leave early from work to take the exam and enroll for the school. Don’t forget to bring your ID card, otherwise you’re out. Don’t forget to bring cash, otherwise you’re out. Well, to be fair, a local Belgian credit card works at some schools. Step 6? I don’t know if there’s a sixth step. Never got that far. I had signed up to take the exam. I had to fill in my contact details. How about letting me know the class is full before I waste my time coming to the school? Classes are full, options are limited. There’s a huge demand for language courses. The incumbents don’t know how to do marketing, sales and customer service in the digital age. A perfect opportunity for a newcomer. EPFC. Levels EU 01-06. Classes in the morning, afternoon and evening. CPAB. Levels UF1-UF8. Morning and evening. Small groups (8-16 students). CLL. Levels A1 to C2. Once per week, 10 weeks. CVO at VUB. Levels A2 to H2. Morning, afternoon and evening classes. Are you selling software or a service as a software to European consumers? If yes, the new taxation rules apply to you. From 2015, you need to know your buyers’ country of residence, use that country’s VAT rate and report your sales to that country’s taxation authority. The problem here is that there are 28 EU member states, each of which has its own value-added tax (VAT) rates, and its own minimum thresholds for having to charge VAT in the first place. For many digital services businesses, this will add a degree of complexity. Yes, this definitely adds a degree of complexity. It is really burdensome for us to find out local rules, thresholds and tax rates. My interpretation is that if your business does not go above the target country’s revenue threshold, you can sell tax free to that country. When selling to France, use the rules, rates and thresholds of France. It was not trivial to find the latest official rates and thresholds on the EU taxation portal so I’ll share the numbers here. Summary in FI: 1.1.2015 alkaen kuluttajille myydyn softan ALV:na pitää käyttää kuluttajan asuinmaan ALV-kantaa ja raportoida myynnit verottajan erityisjärjestelmällä. Verottaja vastasi kysymykseeni, että vähäinen toiminta eri EU-maissa lasketaan maakohtaisesti. Eli vaikka Suomessa toiminta on arvonlisäverovelvollista, Ranskassa ei ole jos myynti pysyy alle Ranskan rajan. Yrityksellä voi olla velvollisuus suorittaa veroa toiseen EU-maahan, vaikka toiminta olisi vähäistä. Yrityksen täytyy selvittää verovelvollisuuden edellytykset kulutusjäsenvaltiosta, eli siitä valtiosta, johon ostaja on sijoittautunut. Eli kääntäen: yrityksellä ei ole velvollisuutta suorittaa veroa toiseen EU-maahan, jos toiminta on vähäistä, ko. maan säännösten mukaan. I was looking for intelligent and int eresting fiction to read during the christmas holidays. As a surprise to myself, I ended up reading science fiction. 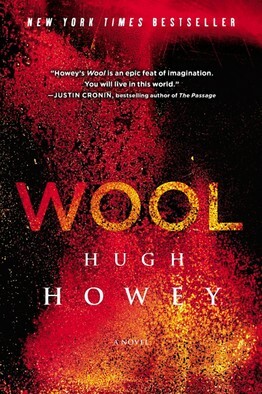 I came by Wool by Hugh Howey first on some “The most popular books” list and when checking the book’s reviews on Amazon, I noticed it was included on their Top-100 Editor’s pick for 2014. The story of Wool takes place on a post-apocalyptic Earth. Humanity clings to survival in the Silo, a subterranean city extending over one hundred and fifty stories beneath the surface. The setting is interesting although typical after-nuclear-war-dystopia. The really interesting part however is that the Silo society has strict authoritarian rules. There are rules concerning family planning and death penalty for rebellion. There’s no freedom of press – or actually – very limited ways to mass-communicate. What makes it interesting is that the author explains the why for these rules. The set of rules sound credible and natural, inevitable and reasonable. I could think of real countries following the same pattern and similar justifications. When the protagonist begins to question these rules, the reader is left wondering if that’s right or wrong. How well would the Silo function without their strict rules? Can you trust people to do the right thing if there’s no enforcing police force? Would you be willing to trade safety for freedom? Unfortunately Hugh Howey doesn’t explore the topic much further but goes on with some action scenes and ends up polarizing the “good” and “bad”. What starts as an intriguing analysis of society, becomes a simplistic adventure. Therefore this book is not a classic but “only” a fun read.